Disability Gymnastics is an adaptation of mainstream gymnastics covering all disciplines and can be recreational or lead to competitive opportunities. British Gymnastics have been developing a programme for disabled gymnasts starting with motor activities for those with more severe mobility problems, leading on to a foundation programme for more able gymnasts. The disability groups can be split into four major categories as follows: Learning, Physical, Hearing, and Visual Impairments. 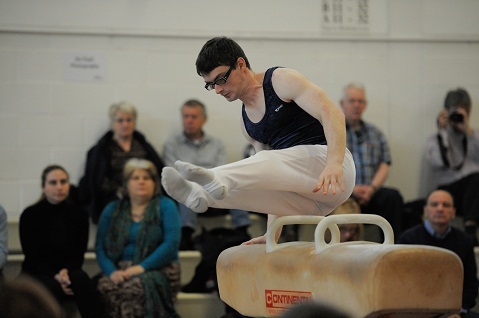 Currently a motor activities programme is being developed which will provide a framework through which even the most profoundly disabled gymnast can participate. Historically people with a learning disability had access to gymnastics through the Special Olympics Movement, however there was no similar provision for those with physical or sensory disabilities. As a result GMPD was set up to develop and provide training and competitive opportunities for people with any disability. Initially this was started using existing Special Olympic Routines but quickly changed to come into line with the mainstream disciplines within BG. A National Development Plan and Voluntary Competition structure was introduced in Men's and Women's Artistic, Acrobatics and Rhythmic gymnastics. Both follow the mainstream format with appropriate modifications. The natural progression from National Competition is onto an International stage. As British Gymnastics was leading the world in the development of the sport it was decided to host the First International Disabilities Gymnastics Competition in Belfast in 2000. This was combined with a Symposium and workshop, sharing the work already done. A second International was held, again in Belfast, in 2003. There are national squads in Rhythmic and Men's Women's Artistic Gymnastics and plans are well underway to develop squads in Trampolining and Aerobics. All of the disciplines within British Gymnastics have a role in the promotion and inclusion of people with disabilities. Whether accommodated within mainstream clubs or in specialised centres, it is every coach's responsibility to provide appropriate level of training for all individuals in their care.